Dice wedding favors make attractive, unique wedding favors for guests and gifts for bridesmaids or groomsmen. If you're getting married, congratulations! Wedding planning produces stress to be sure, but also an opportunity to throw a great party with family and friends. For a stylish gift box, think dice! Give your gifts in a white dice box with red hearts for spots. A red dice gift bag also makes a fun, stylish choice. You've chosen a bag, now it is time to fill it! Lots of dice themed wedding favors exist. Classic white personalized fuzzy dice allow you to insert a photo or message into the favor. Personalize dice mint tins with your name and wedding date to give to your guests. A crystal dice bottle stopper offers an elegant option for a wedding favor. The crystal dice key chain provides an elegant alternative to guests who may not enjoy a bottle stopper. Food offers interesting and tasty possibilities for wedding favors. You can give Las Vegas cookie favors which include dice, cards and other casino symbols. 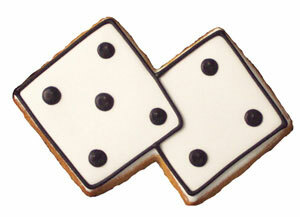 You can also give white and black dice cookies for a delicious treat. Chocolate lovers at your wedding will never forget you if you give them chocolate dice as a wedding favor. Of course, you'll remember to give your guests their dice napkins with their tasty food favors, right? May I recommend two web sites for you to buy dice gifts or favors? 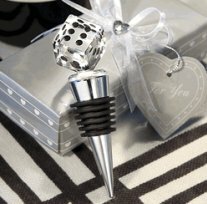 MyWeddingFavors.com carries a good selection of dice wedding favors. Also explore the outstanding selection of favors at Cool Party Favors. Cool-Party-Favors.com specializes in weddings, bar mitzvahs, birthday parties, anniversaries and just about any type of party imaginable.